ASD-STE100 (STE) is a controlled language developed in the early Eighties (as AECMA Simplified English) to help the users of English-language maintenance documentation understand what they read. It was initially applicable to commercial aviation. Then, it became also a requirement for Defence projects, including Land and Sea vehicles. As a consequence, today, primary texts of maintenance manuals are mostly written in STE. On commercial aviation, since 1986, STE has been a requirement of the ATA Specification i2200 (formerly ATA100) and ATA104 (Training). STE is also a requirement of the S1000D Specification. The European Defence Standards Reference (EDSTAR) recommends STE as one of the best practices standard for writing technical documentation to be applied for defense contracting by all EDA (European Defence Agency) participating member states. Today, the success of STE is such that other industries want to use it beyond its intended purpose of maintenance documentation and outside the Aerospace and Defence domains. STE interest is also growing within the Academic world (Engineering and Language). The current issue of STE is dated January 2017 (usually, there is one issue every three or four years). Although the STE structure is stable and consolidated, the language has to be kept in line with the technology evolution and amended on the basis of the continuous and important feedback received from the users. The international language of many industries is English, and English is the language most used for writing technical documentation. However, it is often not the native language of the readers (or even of the authors) of such documentation. Many readers have limited knowledge of English, and are easily confused by complex sentence structures and by the number of meanings and synonyms which English words can have. The key factor for the creation of a controlled and simplified form of English was essentially a request from the customers (i.e. the Airlines), of which 80% are not native English speakers, and their need of doing correct maintenance to guarantee the aircraft availability. Complex technical instructions can be misunderstood and misunderstandings can lead to accidents. STE makes technical texts easy to understand by all readers and can be regarded as an important and valuable resource for technical writing to simplify the correct understanding of the maintenance instructions by the operators, remove linguistic barriers and reduce Human Factors risks. The STE Specification provides a set of Writing Rules and a Dictionary of controlled vocabulary. The Writing Rules cover aspects of grammar and style; the Dictionary specifies the general words that can be used. These words were chosen for their simplicity and ease of recognition. In general, there is only one word for one meaning, and one part of speech for one word. In addition to the specified general vocabulary, STE accepts the use of company-specific or project-oriented technical words (referred to in STE as Technical Names and Technical Verbs), providing that they fit into one of the categories listed in the Specification. Control of additional specific vocabularies is, of course, the responsibility of the companies or the projects themselves. 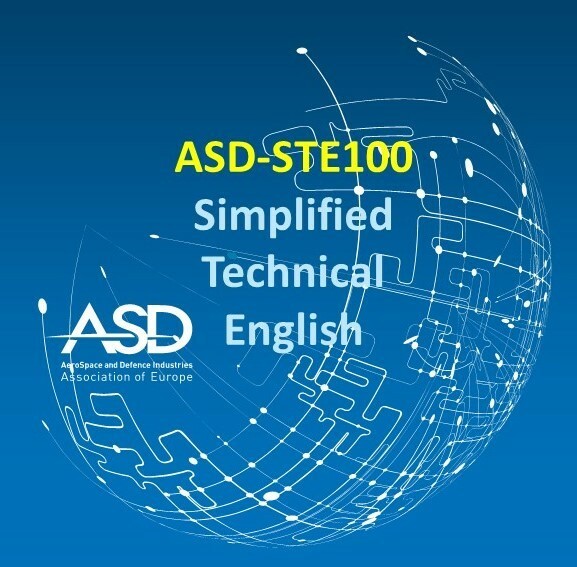 What is ASD Simplified Technical English (STE)? STE is a set of Writing Rules (Part 1) and a Dictionary of controlled vocabulary (Part 2). The Dictionary has sufficient words to express any technical sentence. The words were chosen for their simplicity and ease of recognition. When there are several words in English for a certain thing or action (synonyms), this Specification selects one of these synonyms to the exclusion of the others (whenever possible, “one word – one meaning”). For example, “start” was chosen instead of “begin”, “commence”, “initiate”, or “originate”. When there is a choice between American English and British English words and spelling, the American version is used (Merriam-Webster’s Dictionary). When there are several possible definitions of a word in English, the Specification selects one of these definitions to the exclusion of the others (whenever possible, “one word – one meaning”). For example, “to fall” has the definition of “to move down by the force of gravity”, not “decrease”. The Specification was first released in 1986 as the AECMA Document, PSC-85-16598. Subsequently, several changes, issues and revisions were released up to the present issue. The STE Specification is fully owned by ASD, Brussels, Belgium. The STE specification is maintained by the ASD STEMG consisting of representatives from ASD member countries and non-ASD member countries. The STEMG was originally formed in 1983 as a working group to develop AECMA Simplified English and subsequently, in 2004, when ASD was created, the group changed its name to the STEMG. The STEMG reports to the ASD Product Services Specification Group (PSSG) which in turn reports to the ASD Services Commission. ASD, the ASD STEMG, the Associations, the Airlines and the Companies listed in this web site cannot be held liable if the links referenced in this web site do not lead to the sites stated. ASD, the ASD STEMG, the Associations, the Airlines and the Companies listed in this web site do not support or endorse external commercial companies that link this web site in their own web sites or material, nor are responsible for their possible linking problems. ASD, the ASD STEMG, the Associations, the Airlines and the Companies listed in this web site cannot be held liable for the contents of these external web sites which may not be in line with the principles of ASD-STE100 or contain misleading information.